Maki | Get Your Grub On! Sushi Kusakabe is part of a fabulous 3-in-1-foodie-experience in the midst of Umkirch, a lil town just north-west of Freiburg. Part of this trio is a hotel (Hotel Pfauen #1) and a restaurant that’s half Thai (Villa Thai #2) and half Japanese (Sushi Kusakabe #3). We visited this place for our anniversary last year, and since we kinda loved it back then – like a lot – we returned for this year’s happy occasion again. Diving in, we went exactly the same way as 365 days ago without even realizing it. There was a crisp and tangy tempura moriawase and a tako karaage with a hearty spiced, yet light batter getting us off to a great start. 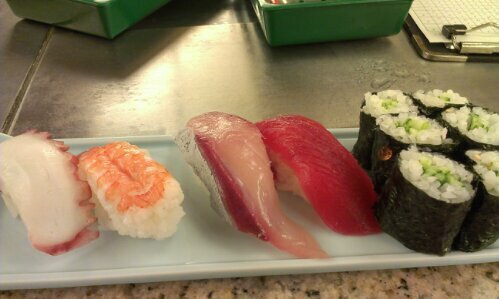 Next up came the main course, sushi galore. I couldn’t hold back (didn’t want to either) and just had to have that outstanding otoro (fatty tuna belly) again despite its higher price tag (Eur9.00/piece). No regrets though as this was a melt-in-my-mouth experience, and one of the best kind at that. Following close behind, right up there on the same quality level, were crunchy, fresh ebi (prawn) nigiri, unagi (eel) glazed with sweet sauce, massaged-til-soft tako (octopus), perfect tamago (omelette) as well as crunchy shinko (pickled radish) and tuna avocado maki. To finish up this wonderful meal we chose the papaya with lime sherbet with little pieces of lime peel for a tad more texture, and the thai favorite: mango sticky rice, which was a bit pricey at Eur12.00. That mango was ripe though and sweet, and the coconut sticky rice balanced out that fruity sweetness just perfectly. All in all another memorable evening filled with amazing food crafted with skill, patience, and experience by sushi master Kusakabe-san. Outstanding performance on the service front as well, and thanks to all the staff that made our dinner such a lovely one. Sure, we left with a lil lighter wallet than we came in with but also with a big fat smile on our faces! 🙂 🙂 See you next year (latest) and domo arigato gozaimasu. A very good friend brought me to ‘Sakuraya Fish Mart’ at West Coast Plaza because it is her family’s go to place for ‘Sashimi‘ and ‘Sushi‘. I entered the restaurant through a small Japanese grocery store and when my friend showed up we chose the ‘Sashimi‘ items from a chilled display right at the entrance. We had the standards ‘Sake‘ (Salmon) which was super soft and ‘Maguro‘ (Tuna) that had the perfect texture and a clean and sweet taste. We also ordered ‘Hotate‘ (Scallop) which tasted good but was a bit moist and slippery, ‘Mekajiki‘ (Swordfish) that I didn’t like because of it’s unpleasant texture and the ‘Kanpachi‘ (Greater Amberjack) and ‘Hamachi‘ (Yellowtail) which both had great taste and were not too lardy on the red bit. 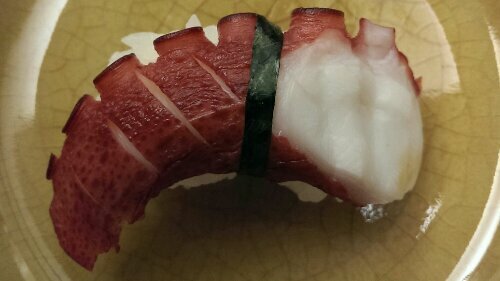 For the second round we had ‘Ebi & Tako‘ Sushi (Cooked Prawn and Octopus) which were ok but not overwhelming and the ‘Tako‘ was actually a bit on the chewy side. 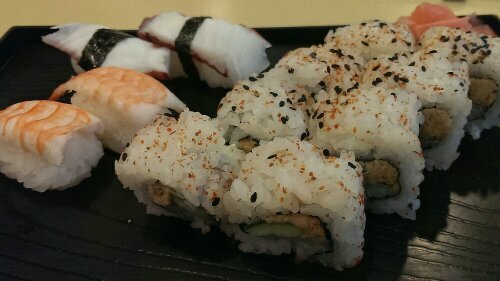 What was actually nice was the ‘Spicy Salmon Maki‘ which was not particularly tangy but had a great crunch from the fried salmon skin they put into it. 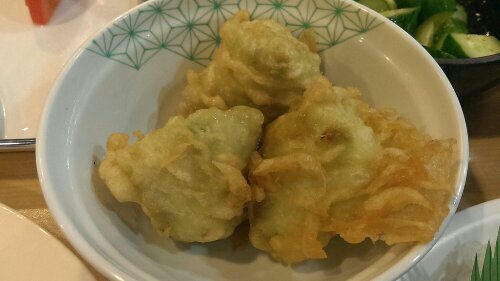 We also ordered some cooked dishes like the ‘Fried Edamame Tofu‘ that was pretty much chunky mashed soya beans in a tofu mix battered and fried. The texture was a bit odd but interesting with the edamame bits in between but the taste was rather blend. Another one was the ‘Fried Tako‘ which was nicely crispy but pretty dry and tough too bite on the other hand. 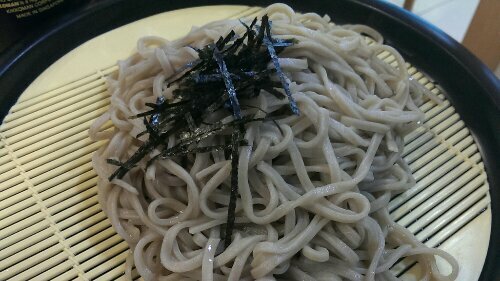 Last but not least we ate the ‘Cold Buckwheat Soba‘. Though taste wise ok, this was a bit of a difficult to eat as the noodles all stuck together in one lump and unfortunately they also didn’t use any ginger in the dipping sauce. I quite like the food here fresh and all and I appreciated that I was able to choose the exact piece of fish I later got on my table but the setup was very mall like and lacked atmosphere but seemed very suitable for families with kids. 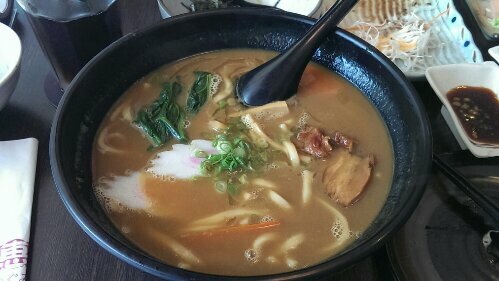 Despite that we just had an ‘Udon‘ lunch this week one of my colleagues suggested to take advantage of the fact that he had a car and make another trip to ‘Megumi’, one of his favorites. It was a sunny Friday and the last time we went it tasted great so it wasn’t really too difficult to convince me. I really liked the ‘Beef Udon‘ the last time but forced myself trying something new so I ordered the ‘Curry Udon‘ instead. The bowl was huge and filled up to the top with noodles, vegetables and meat. The curry broth was more liquid then I the ones I know but therefore also felt lighter than the normal thicker gravy. It had this really deep curry taste with a light spicy kick that did get stronger the further I emptied the bowl. The noodles here are thinner than at most places which makes them a bit easier to eat but unfortunately also were a bit softer than I would have liked. I was happy to find two slices of softly cooked pork belly in there which I prefer heaps over the more common chashu and what was also nice were the big chunks of carrot, the greens and bamboo shoots. The one thing I didn’t like was the kamaboko or Japanese fish cake but I never really liked any sort of fish cake anyway. 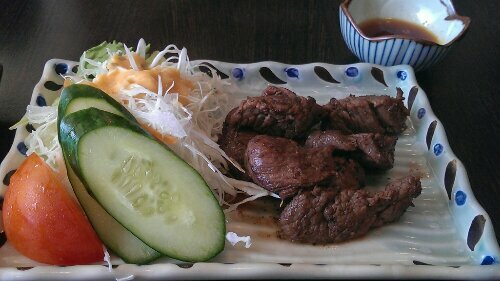 On the side we ordered the ‘Saiko Beef‘ which was lovely tender and juicy and came together with a delicate dipping jus that tasted like strong beef stock mixed with a high quality soya sauce. The fresh crunchy salad aside was a nice change in between and tasted similarly nice dipped into the jus which I’m quite sure was not meant to be for that. 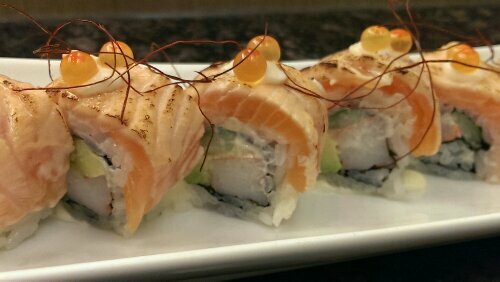 One more side dish was the ‘UFO Maki‘ that had a center of cooked salmon rolled up in a thin cover of super crispy fried salmon skin. It tasted very fresh, the salmon was nice and buttery and the crunchy layer in between gave it all a special taste and a more diversified texture. Still a nice no thrills place with a good selection of tasty dished but also still in a rather off location if you don’t have a car. 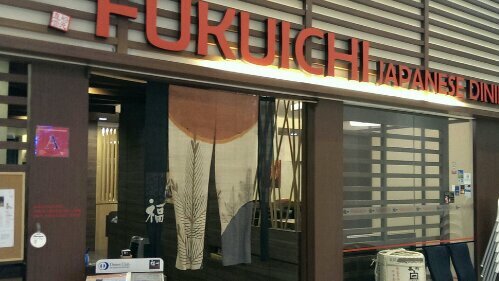 A friend wanted to have some sushi tonight and since we didn’t want to go to the same old place again and again we went to ‘Fukuichi’ at TripleOne Somerset which he had heard good things about. The place had a smart casual setting and we sat down at the big sushi bar in the corner. 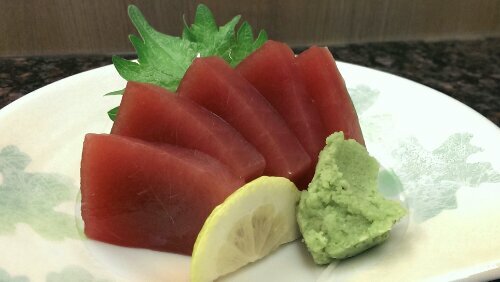 We started with an evergreen – ‘Maguro Sashimi‘ – that was beautifully fresh with a clean sweet taste. The thick slices looked brilliant; dark red in color with a marble like look and the texture was just as I like it, soft and firm. 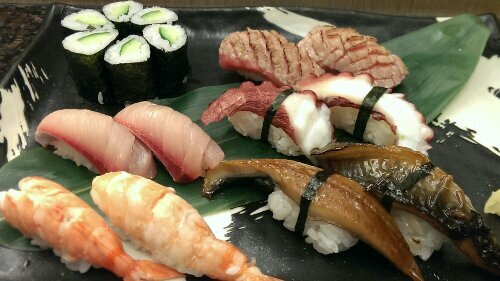 We also ordered a nice selection of sushi – ‘Ebi‘ (Prawn), ‘Hamachi‘ (Yellow Tail), ‘Tako‘ (Octopus), ‘Unagi‘ (Eel) and ‘Aburi Toro‘ (Seared Tuna Belly). 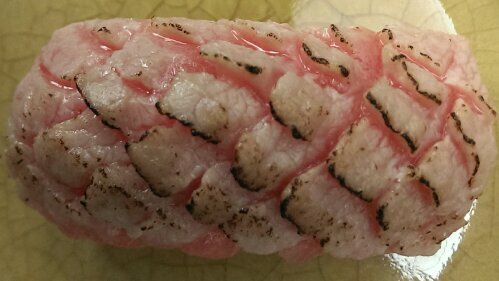 The ‘Aburi Toro‘ was a real eye opener in all presentation, texture and taste. Usually I am not such a huge fan of toro as it tends to be more difficult to chew but not this one, the charred top was warm and crusty and underneath there was a explosion of flavors that literally melted away. Fantastic. The ‘Tako‘ was super fresh and must have been massaged for a very long time as it had the perfect chewiness yet firm texture. It tasted great and was a delight to eat, another sign they really care about the quality of their food. 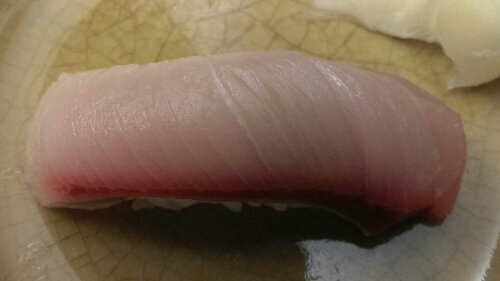 Now the ‘Hamachi‘ was a surprise as it had the same consistency as the lovely maguro and a clean and down to earth flavor. Pure and like straight off the sea. 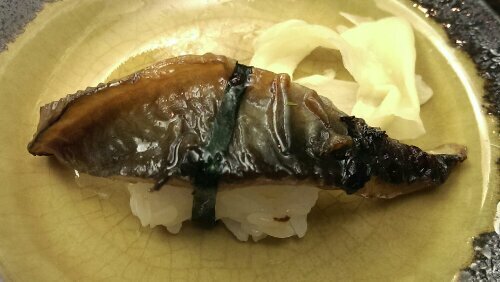 The ‘Unagi‘ was creamy and moist and touched by a hint of this special sweet sauce that did fit the eel perfectly. 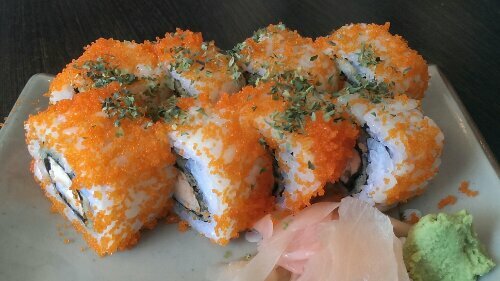 Their ‘Sake Maki‘ reminded me a little bit of the ‘Shiok Maki’ at ‘Koh’s‘. I appreciated they weren’t using as much mayonaise here but I still prefer the normal straight sushi to these “creamy” ones. 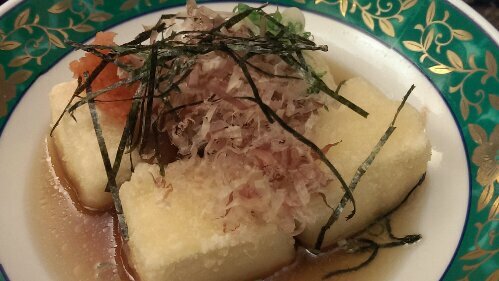 The ‘Agedashi Tofi‘ tasted good but it was much firmer than I would have liked it as I have learned to love the very soft silk tofu which is often used for this dish. 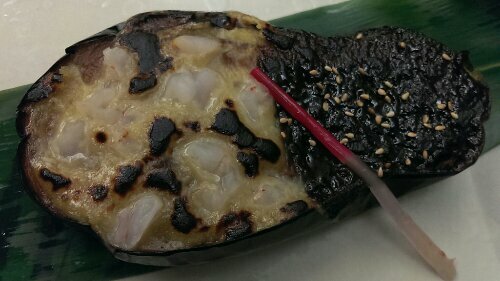 We also ordered a ‘Miso Eggplant‘ of which one half was spiked with prawn chunks and the other half was covered with a thick layer of miso paste. I didn’t really get the prawn part as it didn’t add any special flavor to the dish just a weird alien texture that didn’t really work for me. The prawn free half though was pretty tasty with a nice caramelization and softly baked eggplant flesh. A pinch to sweet maybe. Even that we already had ordered so much, when I realized they had ‘Marlin‘ on the menu I had to try it and later I had to pad myself on the shoulder for this as it was such an awesome idea. This fish really blew me away, nicely grilled and lightly seasoned with a fantastic soya sauce, salt and pepper, nothing else and the meat tasted and felt very similar to nicely grilled tuna. I absolutely adored this and was happy about the generous portion size. We finished our decadent meal with some lovely ‘Cold Udon with Ginger & Scallions‘. 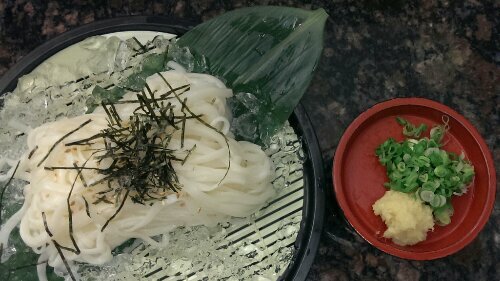 They offer this dish in several variations and with different noodles and we opted for the thin udon. The texture of the noodles was springy and chewy as it’s meant to be and the mix of xo soya sauce, freshly grated ginger and the scallions tasted lovely refreshing and delicate. My liking for cold noodles is constantly increasing and this one right here was a great closer for our dinner. As full as I was after all this food as happy was I to have tried something new. This may not be the cheapest of places around but therefore surely ranks under the best sushi restaurants I have been to in Singapore. Highest quality ingredients, perfectly executed flavor combinations (except the prawn eggplant maybe), the friendly service and the fact that this place has an outdoor sake bar got ‘Fukuichi’ a red bookmark in my collection of places to return too. Amazing. After a beautiful day walking around I felt slightly hungry. My big portion of ‘Tsukemen’ from ‘Menya Musashi’ at lunchtime still made me feel pretty filled but since it was my first day I felt it was my duty to have at least a little something raw and just outside of Shinagawa station there was ‘Ushio’ a small sushi bar that fitted the purpose perfectly. It’s one of these small places you find all around with hardly more than ten seats which unfortunately were all taken when I arrived but after a little wait I finally placed the order for my first round of sushi with the master. I started up with ‘Kappa Maki’ (cucumber roll), ‘Tako’ (octopus), ‘Ebi’ (cooked shrimp), ‘Hamachi’ (yellow tail) and ‘Maguro’ (tuna). The different types of fish tasted fresh and sweet and had great textures, all soft and firm. I particularly liked the dark red ‘Maguro’ and the ‘Tako’ who I grew to love. Beforehand I had read up some sushi etiquette and not knowing if it was actually true I followed it to the last bit. This meant not asking for extra wasabi, what was not necessary anyway and eating the sushi with my hands. The rice was super sticky so it was a bit of a bother getting it off my fingers after eating each piece. Time for the second round. I felt a bit more adventurous so I ordered ‘Engawa’ (halibut), ‘Chutoro’ (medium fatty tuna belly) and to see one familiar face I added a second piece of that lovely tuna. I have no complaints at all about the taste the halibut actually didn’t taste like much but the ‘Chutoro’ had a nice distinct aroma, which was much richer than the lean version. I still preferred my old favorite as both others were borderline in regards to enjoyable texture for me and needed much more chewing to bring them down. 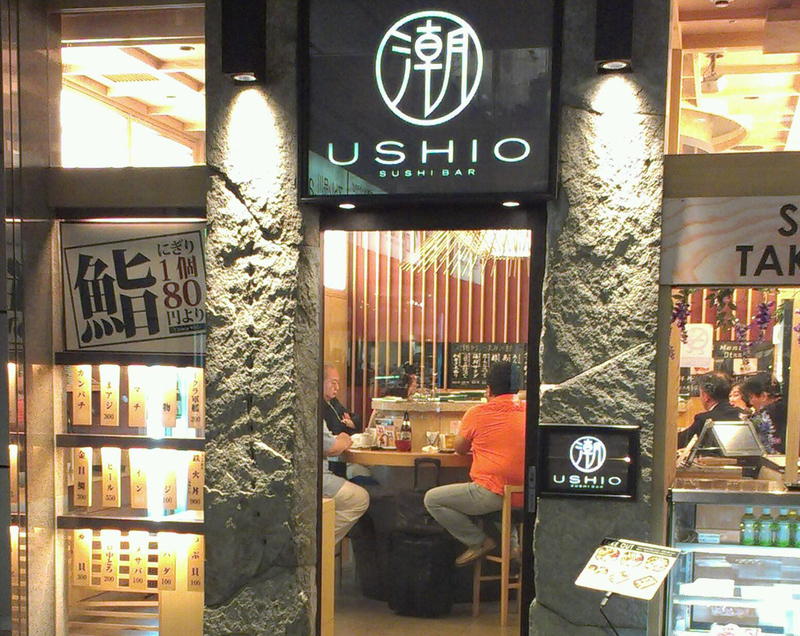 I really liked ‘Ushio’ as a small casual place, yet with atmosphere and this typical Japanese feel of special and hidden elegance. Where else than only in Japan to find a ten seater train station restaurant with tasty quality food at 80-300 JPY per sushi. Not socks of rocking but still much better than many proper restaurants in other countries. Quality Sushi No Cost No Fortune! 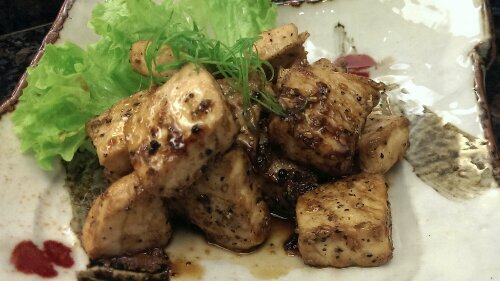 Koh Grill & Sushi Bar in the Food Republic in Wisma is probably my favorite go to casual Japanese dining place in Singapore. Generally I do come here at least once a week as the food is great in quality and taste and when they created the menu they obviously were looking to offer something different. And on top of that prices are moderate and make it possible to pay regular visits. They offer nearly the whole span of Japanese foods like Sushi, Sashimi, Yakitory, Tempura, Ramen and other cooked dishes but during my many visits I have established a list of all star dishes which by default are put on every order with a few items changing depending on what I feel like. 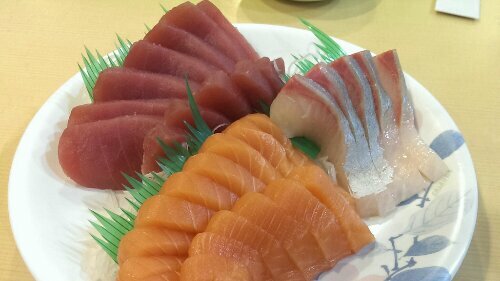 This time as always we ordered our standards; ‘Maguro Sashimi’ which was lean, sweet, of lovely dark red color and tasted so fresh that it made clear why it is my all-time-favorite of stars. We also had their signature ‘Shiok Maki‘ which is a roll filled with Unagi, wrapped with Salmon and that all topped with Japanese Mayo, Fish Roe and slightly charred. This dish tastes great and different, creamy and the roe crunches between your teeth but when you’re only a party of two the mayo becomes a bit overwhelming after the third piece. 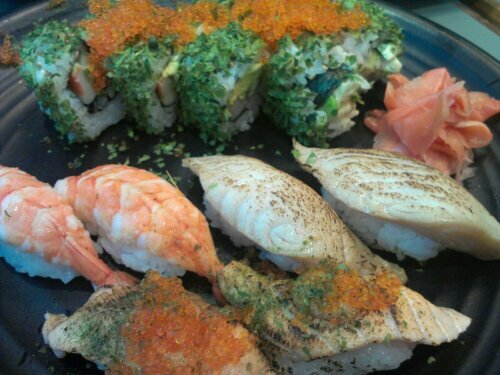 My regular sushi selection is a trio of ‘Ebi‘, ‘Slighty Grilled Salmon‘ and ‘Slight Grilled Shuro Maguro‘. The first two never disappoint but the Shuro Maguro stands out as I also never saw it anywhere else. It is not a type of tuna as the name might imply but a white fish which they marinate in Shochu. They have it also as a raw version but my favorite is still the one that touched fire as it changes consistency and melts in your mouth and you will be happy that you gave it a try. The last arrivals of the standard order were two small pieces of grilled tuna in a light lemony pepper vinaigrette which were perfectly charred on 5 sides and work together fantastically with the thinly chopped spring onions and cracked peppercorns. On top of this already generous meal we ordered their ‘Tropical Maki‘ which was the only slight downer as there was nothing really tropical about them. I assumed mango being part of it but a quick analysis of the menu picture clarified that it was what it was – Surimi, Avocado and Cucumber. Not bad but just not what I had hoped for. A second extra were the ‘Pan Fried Udon‘. I love this dish as it combines so many different flavors. The plate is filled up with fried udon and fresh vegetables like spring onion and carrots that have the perfect bite to them, sprinkled with tuna flakes and a sweet sauce that reminds me of Okonomiyaki. It’s good to know there are places like Koh and New Garo out there, serving up high quality Japanese food to moderate prices. I’ll be back soon.